Amazon is always trying out new ideas: some work, others fail. Now the retailer is testing the idea of sending laborers to your house. Geek Wire has spotted that Amazon is testing a service—just in the Seattle area for now—whereby a friendly guy turns up at your place to install a new TV mount in your home. It's hardly a new idea, but it's a radical one for an online retailer. 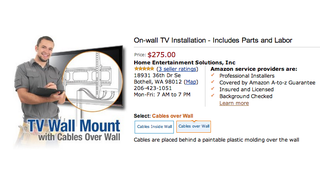 Currently, the service costs $275, which includes the cost of the TV mount itself and installation. No TV included, obviously. The work is actually carried out by a third party—in this case Bothell-based Home Entertainment Solutions—and the installation can obviously be reviewed like any other product on Amazon.